Ouch. Pretty rough, right? 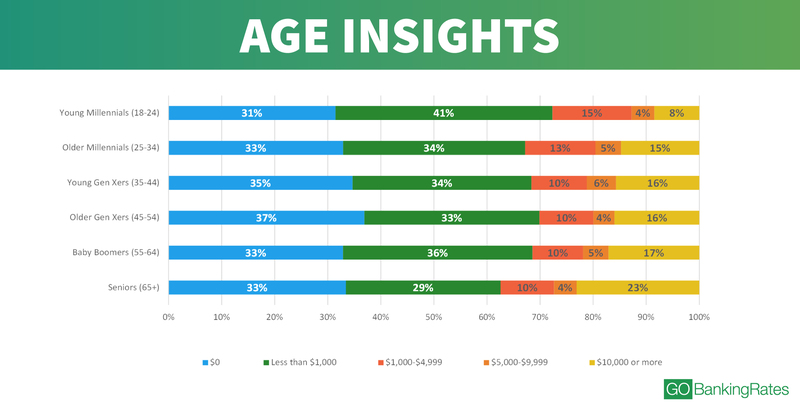 As Millennials are starting to get older (30 seems horrifically closer and closer for me), there are a lot of numbers and money studies starting to swirl around out there. I can tell you from personal experience talking to large financial companies last year – they are a little scared. The reason is really pretty simple: as a generation we are starting to mature in the job force, and these companies want our money as we make it. The problem is…a lot of us are struggling to save any. It's hard for banks and brokerages to make money with our money if it's not there. GoBankingRates.com came out with a study recently that had some pretty interesting statistics about Millennials and the amount that we're saving. If you're still looking for a New Year's resolution or already gave up on your new diet, you may want to consider building up your emergency savings account! Now to be completely fair, I'm not sure how realistic it is for the vast majority of the younger group of Millennials to actually have healthy savings accounts. Especially for college students…we all remember how lean those times were. But if you're an older Millennial, you should absolutely be working towards creating a good emergency savings fund. Not only does it make you sleep better at night, but it will keep you from having to bust out the credit card in rough times. I'm honestly not here to judge how everyone chooses to live. I've talked to too many people over the last two years that have such wildly different financial and living situations. I've been very open about living with my wife's parents for a few years after college, but obviously not everyone wants to or can do something like that. But I will ask that you take a look at your living situation and consider if you actually need the level of comfort that you want. I think so many Millennials are in a rush to have the finer things in life right now, when they don't realize that there is value in having less space or comfort and delaying their gratification. I appreciate everything I have so much more now after living well below my means after college. It also helped me save a ton of money. Just food for thought if you're considering a super nice apartment or the nicest house you can afford. There are a ton of different studies out there about food spending, and they all point to a few main things: we eat out too much and waste too much food. I did an interview with Alexandra Talty from Forbes earlier in the year (you can see the article here), and she put together a great story about Millennials and food costs! This one can honestly be pretty simple. You don't have to completely eliminate going out to eat from your life, but instead limit it to a number per month that you feel comfortable with. You can also use food delivery services like Blue Apron, which are generally cheaper than eating at a restaurant. Seriously though, if you are having trouble finding extra money to put away every month, start doing something extra on the side! Fully understanding the internet gives Millennials a unique advantage of being able to create small businesses for minimal start-up costs. Building a successful side hustle doesn't have to take every hour of your free time, but you will have to stay up a little later and work on the weekends. In my opinion, that's a small price to pay for having another way to make money. If you aren't using either Mint or Personal Capital (or both), you really should be. At LEAST check them out and give them a try. Mint is a pretty remarkable budgeting tool for seeing exactly where your money goes every month. Personal Capital is a great tool you can use to view and track your net worth, and also has budgeting and spending alert tools. Both of them are freaking free. Just use them. What have you cut back on to save more in the past? Great post! My roommate and I made a New Year’s resolution to split food costs on dinner in order to save money and stop wasting food (and curb the amount of times we eat out). We meet once a week to go over what meals we want to prepare. Each one of us buys the ingredients for the meal we chose and we make enough of each meal to last us both for the week. That way we get some variety and have just enough food without wasting anything. I’m interested to see how much this saves us and then maybe try it for lunch or breakfast. That’s awesome! One of the most effective strategies for saving money on food for me and my wife is just making sure we hit the grocery store every week at the same time. It sounds stupid simple, but we tend to eat our more when we miss our grocery store day. Hey now! You must respect your elders 😉 Great post! Being a young Gen Xer, I was happy to look at your chart to see I’m on the top tier (and always have been – I might add) but that isn’t saying much. Looking at these numbers is scary. I feel like we’re staring down the barrel of a future financial crisis. I grew up on the “poor” side and always made savings/investing a priority, but even doing so, I made plenty of mistakes along the way and could easily be early retired already. Oh well, you live and learn and do better. Keep up the awesome job inspiring youngsters to pay attention to their finances. Time truly is the most valuable asset. Saving on the big stuff like housing, transportation, and food will pay dividends (literally) in the future. As long as the difference is invested. Again, great post! If anything I’ve learned that it’s OK not to have all the nice stuff at a young age. Most of the things I know now are things I learned from boomers and Gen-xers! What advise do you give to Millennial’s? We trimmed our grocery budget down to $200 a month for two people and we haven’t looked back since! It took some guess and check, but it’s really comfortable surprisingly. It makes a huge difference when you notice how much of your income you’re consuming/eating without noticing or needing to! Side hustling helps. Making more money helps. But just figuring out where our money was going helped the most. Especially since I was so good at wasting it. Oops! I agree – learning to save and/or cut back is more important to me than making extra money. It creates a foundation to build on! $200 for the month is awesome!!!!! Maybe it’s tougher for age 30+ Millennials since at that age we’re typically owning homes and having kids? Not that you can’t save with those things–you totally can. But it’s definitely more challenging and distracting. We also slashed our electricity bills by switching to LED lightbulbs, installing efficient appliances, and insulating more. We save don car insurance by asking our insurer for discounts and put a waiting period on all non-essential buys. Yeah I think you’re right – it just seems like there is more stuff to spend money on as we all get older haha. I think there is a lot of truth to that – sometimes we don’t realize how lucky we are to live in a place with opportunity. This will sound totally off-topic, but I’ve been watching a lot of WWII documentaries lately. It has definitely put my life into perspective when you see some of the horrible things that have happened in other places around the world. Yeah they are a little scary, but not really too surprising. So many people live exactly at their income level. Great post! I have also noticed that when I miss my grocery shopping days or my significant other and I don’t go together, we tend to eat out a lot more. This year we are definitely making it a point to cut back spending in all areas in order to pay off our debts. So far, we are off to a great start. Reading your blog daily has instilled in me the confidence I need to make some big changes in my life! Thank you! Great Post. I’m an older millennial, dancing on the cusp of not being one at all. I cut back on my cell phone bill. (Not trying to plug in an advertisement by any means.) I switched to Project Fi because I have WiFi access most everywhere I go. Now instead of paying $80+ a month when I was with AT&T I am down to $35 after taxes and fees. Haha no problem – I love suggestions! I’ll take a look at that…seems really interesting. I’ve cut cable, switched cell providers to Republic Wireless, and cut way back on eating out, but the two biggest savers for us have been buying way less house then the bank said we could, and driving used cars so we don’t have monthly payments! That’s awesome! I know a lot of bloggers are using Republic – do you like it? It servers my needs completely, the only draw back is when driving through a city it can drop calls b/c it keeps picking up different wifi signals. I’ve learned to turn wifi off at certain times. You can’t beat 13$ per month though. Nowadays, we have an apartment we love, it’s a little on the pricey side, sigh, but we’ll re-evaluate when the lease come back for renewal in November. I’m OK with a smaller apartment if it means saving a few hundred dollars a month, but I gotta convince the hubby of that. My biggest goal this year is tracking our food costs. Like you said, we do eat out a lot, so we set a monthly eating out budget so that’ll hold us accountable. Food costs are so hard! My wife and I like going out to eat, so it’s always been tough to cut back on it but we really committed to it last year. We try to cook as often as we can, and we definitely liked trying out Blue Apron earlier in the year too. Those are some scary stats, 67% of older millennials have less than $1,000 saved?! Wow…. I assume these numbers include retirement savings as well, right? I want to say it was just savings accounts, but I’d have to go back and check. I really hope it isn’t retirement as well haha. Honestly pretty scary that so many people are not in control of their finances. Our motto “Living Frugal & Free” definitely applies here. When you have no savings you have no plan for when life gives you lemons. I forget Dave Ramseys numbers but somewhere close to 80% of people will suffer an expense of over $1,000 over a ten-year span, I hope people are prepared for that. Checking our budget every month and ensuring we are in the black is a great feeling. Growing real wealth comes from having control. I really like your income posts and how you explain that it has not really changed your life. It shows that you are well grounded and know what true happiness is all about. Thanks for another great post! Have a great week and keep GRINDING! I think one of the main reasons for nothing changing as far as higher income is because I still only pay myself a small salary. I’m not sure what my tax implications will be, and I want to churn money back into the business throughout the year. I don’t need to get rich quick or anything haha! Thanks for the tip! That’s definitely something I’m going to try to add in when I have the site redone next month. Your section on food can be a gold mine for most people. We’ve found meal planning to be a huge tool. Over time, you can start to develop a list of staples you can eat on a routine basis. It helps because you can start buying certain items in bulk, like rice. Before my wife and I started meal planning, we would go to the grocery store at least twice a week. We would basically wander the store buying whatever we thought we needed. Well, you can take a guess on what would happen: overspending and buying what we didn’t need. Now we take about 30 minutes every week thinking about what we want to eat and what we need to buy to make it. It’s helped soooo much. Thanks for mentioning food – it can be a huge spending trap since us millennials are often foodies. No problem – I totally agree! We do like our food and probably more importantly the experience that goes along with food. It’s so easy to ignore how much money we spend there! It’s so sad and scary to read stats like this! And I have plenty of millennial friends (I’m just barely on the old end of that scale!) who complain about their student loans, yet post on social media two and three times a week that they’re at some great bar or restaurant! It just doesn’t add up. And the Washington Post just had an article on how millennials may need to save double what they are to have a retirement (due to poor market returns projected). Just makes me more committed to never going into debt and saving at a super high rate! And I agree – it’s a very similar habit as saying they don’t have time to work extra when they watch every new episode of GOT and How to Get Away With Murder. I have always kept $1k in savings for an emergency per Dave Ramsey’s get out of debt plan. Since July 2016 I set up an automatic savings plan to increase this amount because I realized how important a cash emergency fund is. (I noticed you did something similar while paying off your Student Loan Debt). My EF isn’t fully funded, but I feel a little more secure than before. Once out of debt (projected April 2017) I’m planning to fund my EF 6 months expenses. I saved some money in 2016 by moving in with a roommate, car pooling, and meal prepping. I hope to improve upon my spending habits this year! Dang it sounds like you killed it in 2016! Yes, I did take a break from aggressively paying back my loans so I could build up an emergency fund. What have we cut back on? DEBT! Our family got out of debt & will never go back again. If we don’t have cash, we don’t buy it. Other areas we’ve cut back in (or never spent in): cable TV & movie rentals – we’ve never paid for cable TV and we quit paying to rent movies. Now we get all our movies from the library for free! We also check more books out of the library for free instead of purchasing them (hard to do sometimes for our family of bibliophiles). We buy used cars instead of new, grow our own vegetables & herbs, and cook most of our meals at home. As boomers who started a little late in the savings game, we’re working hard to catch up on retirement savings – expect to put the max in my 401K for 2017. I don’t have cable either! I don’t know why people keep paying for it. Sounds like you’re going to have a great 2017! This is very true. It stems from the environment that millennials grew up in. Specifically the younger millennials. Those that don’t remember a world before the internet, before everyone had a cell phone, and when you had to use encyclopedias and other books to research a paper for school. The world they are used to is instant gratification. You can look anything up on Google in an instant. You can buy anything you want on Amazon and millions of other sites in an instant. From an economic standpoint, an accomodative money policy for most of their adult life has made it easier to buy more early on. More house, more car, you name it. They just aren’t used to waiting. Another interesting point is that those millennials that do save haven’t taken advantage of the bull market. I wrote about this on my blog recently. They came of age during the Great Recession and have a lot of fear of investing. This coupled with low financial literacy has led to them investing to conservatively for their age, with many preferring cash and other overly safe investments. I love this but I’m confused about the labeling of younger millennials. What about Gen Z? These statistics are distressing for sure. And we all know how hard it is to be the “only one” trying to be smart with our money. Mom always said, “You are who you hang out with,” and most of us hang out with people spending money as fast as it shows up – or even faster with the power of credit cards. Being able to be part of a community of savers is a huge help!